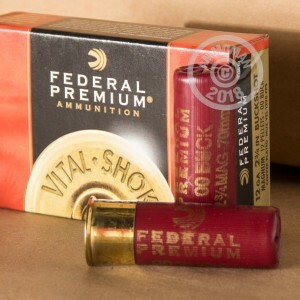 These 12 gauge shotshells from Federal are a high-pellet load suitable for hunting or rural self-defense. 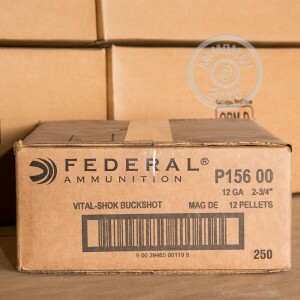 Each 2-3/4" shell in this box of 5 fires 12 pellets of 00 buck at 1,290 feet per second--more than enough to bag a deer out to a considerable distance. In order to prevent deformation and enhance accuracy, these shells use copper-plated pellets and spiral stacking shot configuration with buffers. 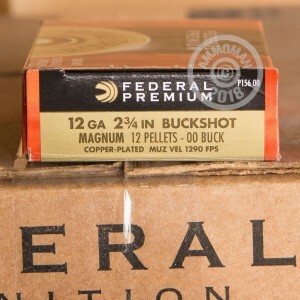 Stock up on all types of ammunition at AmmoMan.com and get free shipping on all orders over $99!